Mrawrrrrrrr. 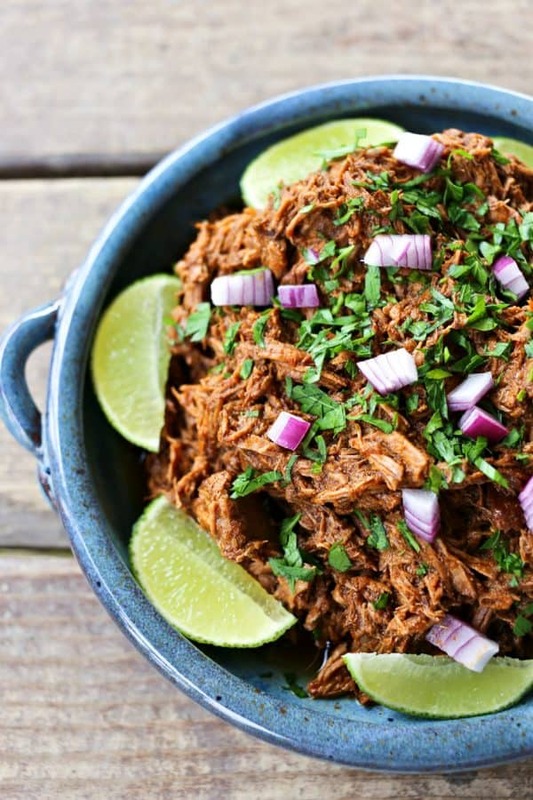 Today’s Slow-Cooker Copycat Chipotle Barbacoa Recipe makes me purr. I can’t help myself. Garlicky, tender, shredded beef braised low and slow in a spicy, smoky, flavourful barbecue sauce. It doesn’t hurt matters that it cooks all day (or all night!) while you run errands or do yardwork or try desperately not to eat the contents of the pantry while you smell this simmering in the fragrant barbecue sauce. Or is that just me? 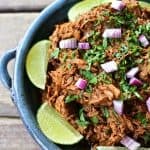 This Slow-Cooker Copycat Chipotle Barbacoa Recipe is the jumping off point for a whole host of meals, which is why I call for such a large cut of chuck roast. I’m aware that 6 to 8 pounds is a great deal of meat, but it fits easily into most slow-cookers, and since you have it going all that time, and the end results of the recipe freeze so incredibly nicely, you might as well get the most bang you can for your energy and food buck. Even for a family my size, this yields several meals worth of entree portions. Another great option for big batches in the slow cooker is this crockpot chicken breast. What are some of the magical ways you can serve our Slow-Cooker Copycat Chipotle Barbacoa Recipe? In warmed homemade corn tortillas with a handful of chopped onions, some fresh cilantro and a squeeze of lime for a Mexican style taco. Not a corn tortilla fan? Serve Slow-Cooker Copycat Chipotle Barbacoa Recipe in crispy taco shells or flour tortillas with your favourite taco toppings. You’ll be in heaven! Ready for burrito night? Serve rolled up in a flour tortilla with refried beans, some cilantro lime rice, a sprinkling of cheese, some sour cream, a little salsa, some pickled onions, and some avocado cubes or any variation on the burrito theme. 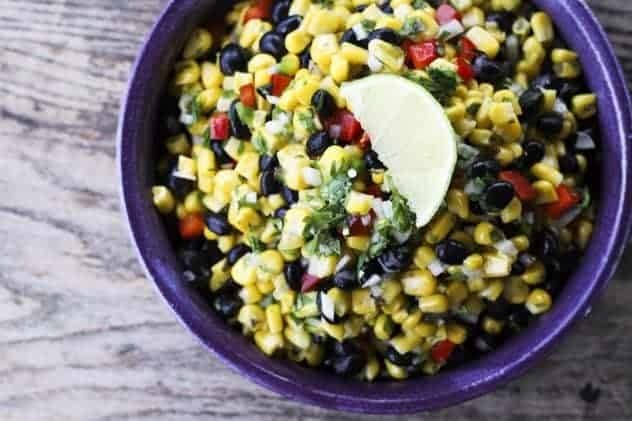 Serve on top of hot rice with your favourite taco or burrito fillings for a Taco or Burrito Bowl. This is great for a nutritious, filling, crowd-pleasing meal on busy family nights. Serve with Mexican Fideo Soup for a hearty and memorable meal. Serve Slow-Cooker Copycat Chipotle Barbacoa Recipe over a baked Russet or sweet potato. 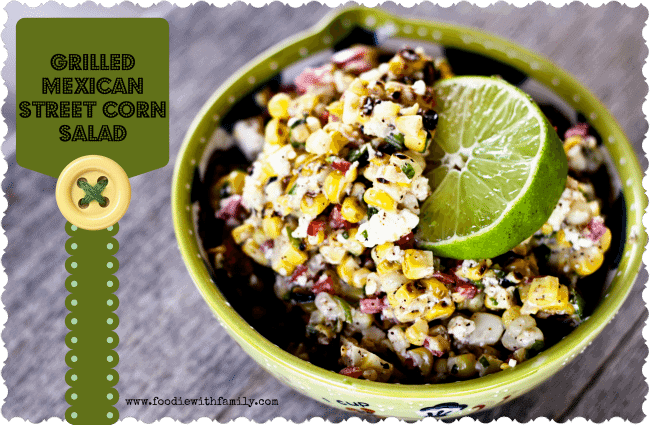 A dollop of sour cream or crema (or again, those taco toppings…) would make this a filling and delicious option. Nacho time, of course. Serve over hot tortilla chips baked with cheese on them (and perhaps Candied Jalapenos?) for some memorable nachos. Mix into your favourite queso dip recipe for some serious sustenance and flavour. A fork. Just use a fork, man. Chuck roasts are a great cut for this Slow-Cooker Copycat Chipotle Barbacoa Recipe because it’s a selection of beef that has a lot of tissues to break down in the braising process. Additionally, those connective tissues add a velvety texture to the final sauce that you just can’t get from a leaner piece of beef. This could also be made with the easier to trim (and far more expensive) flank steak. Trim as much of the visible fat as is possible from the outside of the roast (and any large fat veins on the inside) before cutting into 2-inch-ish cubes. I’ve included an optional step in the recipe, but I do recommend it unless you’re unequivocally morally opposed to cooking anything before it goes into the slow-cooker. I DO heartily recommend taking the 5 or 10 minutes it takes to brown the chuck before soaking it in the barbacoa sauce.Why? It’s not to seal in moisture. That’s an old wive’s tale. It’s add another level of WOWZA to the flavour profile. It adds depth to the beef. Can you make this without browning it? Absolutely. Will it still be delicious? Yep. But do I recommend browning it? Yes, I do. Try it both ways and see which way you prefer it. I mention that you can use beef or chicken broth or a lager beer in the recipe. It will be equally delicious if different with each of those three options. Don’t be tempted to go for a hoppy micro-brew in this situation as the hops may compete with the chipotles in adobo. A lighter lager style is where it’s at. I do suggest you let the beef cubes soak in the sauce overnight to marinate thoroughly. I HAVE, however, been in a hurry and cooked it within roughly 25 seconds of pouring the sauce over the beef. It was delicious. The one that marinated overnight was even better, though. Consider yourself informed. After the beef has cooked to the point where it shreds quite easily with a fork, you have a couple of options. If you have a ton of liquid in the slow-cooker, you can dip it out into a pan using a ladle and put the pan over medium heat until the liquid reduces by half or more and thickens. Pour back into the slow-cooker with the beef and use two forks to shred the beef. Freeze any thoroughly cooled leftovers in air-tight containers or zipper top freezer bags in single meal portions. Date and label those bags so you don’t forget what’s in them. That will make it easier to use on the fly. Garlicky, tender, shredded beef braised low and slow in a spicy, smoky, flavourful barbecue sauce. Serve in burritos or with lime-cilantro rice. 2 tablespoons oregano preferably Mexican oregano, but all oregano will do! Drizzle the vegetable oil in a heavy-bottomed skillet over medium high heat. Brown the beef cubes on all sides in batches (you do not want to overcrowd the pan). Add the beef (whether you've browned it or not) to the crock of a slow-cooker. 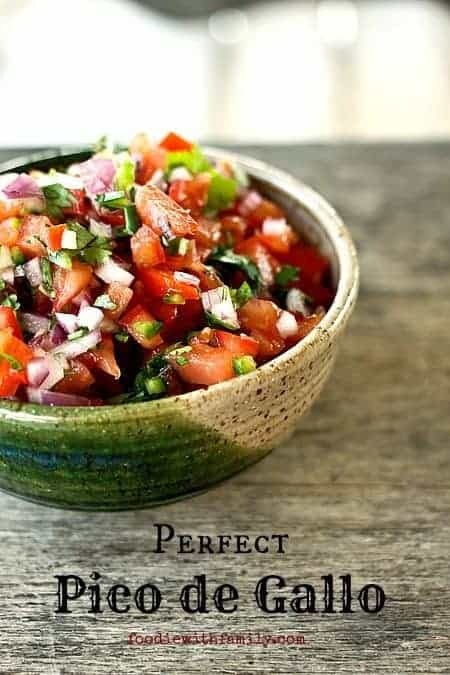 Add the chipotles in adobo, onion, garlic, broth or beer, apple cider vinegar, lime juice, cumin, oregano, ground cloves, salt, and black pepper to a blender and blend on high until smooth. Toss the bay leaves on top of the beef, pour the contents of the blender over the contents, stir., and cover Let the beef stand overnight to marinate. In the morning, add the crock to the slow-cooker, turn the temperature to LOW. Cook 8 hours on LOW or 4 hours on HIGH, or until the beef shreds very easily with a fork. Remove and discard the bay leaves. Use two forks to shred the meat in the sauces. Serve the shredded Barbacoa with sauces over rice, in corn tortillas with onion and cilantro, in burritos, soups, on nachos, or just with a fork! I most often make my Mexican pulled meat for tacos with chicken but I do love beef so this is definitely going to have to be made. Are you an angel? Barbacoa is my FAVORITE Chipotle meat! I’m talking I get it every. single. time. I might have a problem. Does this truly taste like my favorite Mexican treat? Oh my! Made this yesterday and couldn’t quite wait till the ‘holiday’ to eat it – it was SO GOOD! In fact, it was so good that it put the fancy food truck tacos to shame that I”d been looking forward to for so long. I only had half of a lime (oops … gin and tonic season…) but it was just perfect. I also separated the meat from the broth (I think I had extra sauce – I was too cheap to buy quite that much meat and I THOUGHT I cut the rest in half as well, but it’s entirely possible that I got caught up in the moment and didn’t actually DO it). But I added part of the sauce back to the shredded meat and froze a good cup and a half or more to use over quesadillas or burritos later when I”m in a hurry. I love the non-stick stove top safe insert for my slow cooker – it makes the browning of the meat no extra work at all. Just a fun tip, I buy the biggest cans I can find of chipotles in adobo sauce and then puree the whole can in my little food processor, use what I need for that go-round and then put the rest in a pint sized siplock freezer bag and freeze it FLAT – then I can just break off chunks when I need them, prechopped, no muss, no fuss! This recipe is totally a keeper and one I will make over and over. This was FANTASTIC!!! I made it this weekend for a small crowd of men, teenage boys and a couple of women (including myself) who can eat like men. There was definitely enough meat for a few meals. Everyone loved it! Thank you for sharing the recipe. I couldn’t help but wonder how it would be made with pork shoulder– have you ever tried to make it like carnitas? Thanks for taking the time to tell me you loved it! I do pork shoulder quite similarly. Here’s a link for it! Wow! This is delicious!! I made it just as you said with all the extra steps and it was AMAZING! (and yes, I’m yelling, because it was so good!) I took it on a group camping trip in an aluminum pan covered in foil, reheated it on a camp stove and people couldn’t stop talking about it! Trouble is, now they think I can cook. 🙂 Thanks for the recipe! HA! That’s awesome, Pam! I’m camping soon and this is a great reminder that barbacoa would make a fantastic addition to our camping meals! 8 Lbs of roast!!! Why would I want to make a $100 dinner at home?? I haven’t seen chuck roast run that expensively! When I get it on sale I get it for under $5/lb and when I buy full price I don’t pay over $8/lb. Aside from that, there is a compelling reason to spend a good amount of money to make this yourself. You’re going to get a meal that is just as good or better than getting it at the restaurant. While you’re laying out a fair amount of money up front, you get significantly MORE food for your dollar. We’re talking about several meals worth of food, here! I have about 4 lb of chuck roast & chuck steak meat in my freezer — small packages for a small family 😉 — so am I right in thinking I should halve all the ingredients? That seems like not much seasoning, but I know some flavors get stronger in the slow cooker. Hi Ailie- Were I you, I’d plunk two of those 4 pound roasts in and get the biggest bang for my electricity buck (since you have the slow-cooker going already) by cooking them at the same time, maintaining the seasoning level. If you’d really like to do the half sized one, I would reduce the spices by 1/3 rather than by half… I do think it might lose some of the seasoning “oomph” if you reduce the flavour components by half. Thanks for replying so quickly! I talked my friend into digging a chuck roast out of her freezer, and we’ll split the leftovers after we have dinner together. (Given what I’m doing with the meat, this was not hard to negotiate.) It’s gonna be a long 8 hours until dinnertime…! 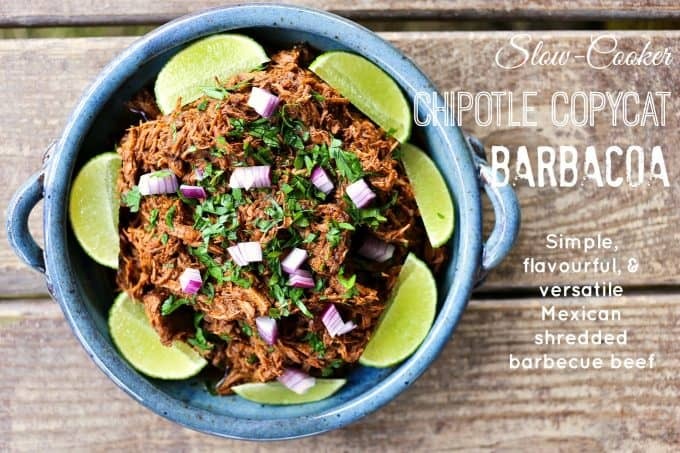 Barbacoa is my absolute favorite, I cannot wait to try this! However, there is no Step 2, am I missing something?? Every cut of meat is a little different, so sometimes you have to allow for extra cooking time. If it doesn’t shred, just leave it in the sauces simmering on low longer! Ever done this without marinating first? I didn’t notice that step and just put it in the crock pot! 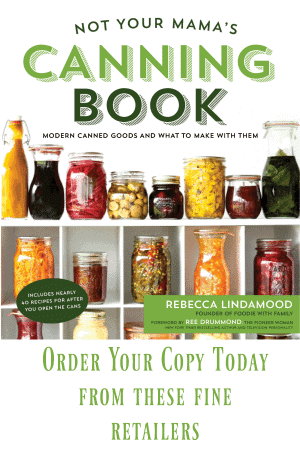 Hi Sheena- This is a canned product. I know many super Walmarts carry them as do many Target stores. They’re most often near the Mexican foods (or TexMex foods like taco shells, salsas, etc…) in decently stocked grocery stores. If you can’t find them locally, you can always order them via Amazon.com! I made this recipe about a year or so ago. It was amazing!!! My husband and I absolutely loved it. I want to make it again for some families who aren’t all that excited about spicyness. It’s been so long I can’t recall how spicy this is to begin with (considering the chipotles, my favorite part). Can you help remind me? I made this recently and it is incredible! I froze the leftovers for a dinner party. My question is what is the best way to reheat the meat? I am defrosting it in the fridge first. I don’t want to lose the integrity of the shredded beef. Thank you in advance! I would put the beef and sauce in a baking dish, cover lightly with foil, making sure one side is vented, and bake at 350°F until heated through! Do you think it would be ok if I marinate it overnight, brown in the morning, and then put it in the crockpot? I’m only wondering if it’s a great idea to get it hot and then put in the fridge for a day without cooking it? Or will it not get hot enough when browning? Maybe I’m weird about food safety. Just wondering. I’m going to try to make this for a baby shower but in the oven. Do you know what the cook time and on what temp it would be? I’m utilizing my crockpot for shredded chicken so oven is my next cooking space:) also with 6 chipotles in adobe is this really spicy? Can’t wait to cook this! As for the 6 chipotles, I don’t find it very spicy, but that’s all personal perspective! I hope you and your guests enjoy it! I made this recipe for our NYE Bash last night! It was a big hit! I made it with Brisket and served street taco style (make your own). I received a ton of compliments and requests to make it again. Next time I am going to make it a day earlier and let it sit in the braising liquid over night after its cooked and shredded (in addition to letting it properly marinate the night before). It was even more flavorful when we had leftovers today so I will try to recreate that on a bigger scale. Thanks for posting this! Fantastic, Ben! Thank you so much for letting me know you loved it! I made this according to the recipe and I was blown away. It IS Chipotle barbacoa! For even more intense flavor, reserve a little bit of the marinade to mix with the finished beef. I cooked it in an InstaPot for 90 minuets and it was perfect. That is fantastic, Jim! I’m so glad you like it so much; thank you for the excellent review! This looks amazing…! Barbacoa is my favorite. Thanks for sharing. I definitely try this at my home. Serve it with lots of sour cream and cheese! I would say, too, that you could probably tame it with a bit of tomato sauce added. It will make it a little more saucy, of course! How spicy do you think this is according to your recipe? Would adding a couple jalapenos be too spicy? Is the oregano dry or fresh? The package for the fresh says triple the amount if in place of dry. Hi Sharon- The recipe is designed to be made with dry oregano, but you can definitely use the fresh if you triple the quantity! Do you let it marinade over night in the fridge or let it sit out? Pop it in the fridge!! I went ahead and just turned it on now. Now we can have burrito bowls all day long tomorrow lol. Hello! I wanted to share my experience making this as a vegetarian. Prior to being a vegetarian Chipotle’s barbacoa was a weakness of mine. I can often taste it even after the years it has been since I ate it…until now ❤️. Rather than beef I used two pounds of mushrooms (note: you can use three pounds – don’t be discouraged by the lack of sauce covering all the mushrooms when you marinate it because that all break down and soaks together in the crock pot) I did all instructions as provided EXCEPT the cooking length because mushrooms aren’t raw meet and don’t need to sit in a crockpot for 8 hours. THIS IS INSANE! I am so happy I took pictures and sent them to everyone I know!! My husband thinks it’s incredible and requests it be a reoccurring item on our weekly menu! You just made my day, Jeannette!! And that is brilliant modification for this. I’m definitely going to give it a try! This recipe is a huge waste of time and money. It tastes nothing like Chipotle barbacoa! Waaaaay to much ground clove, I cannot get the smell out of my house or my slow cooker. I would give zero stars if I could. We’re going to have to agree to disagree on this one, Mel… We eat and enjoy this quite often and we think it tastes as good as or better than Chipotle’s Barbacoa. 🙂 If you opt to try it again, reduce or omit the clove to suit your own preference. I can’t say how much my family LOVED this recipe! The flavors were perfect. I’m a notorious reader/modifier of recipes as and this one is absolutely perfect as is. The recipe is super easy to follow. We used the leftovers in nachos the next day and they were AMAZING!!! 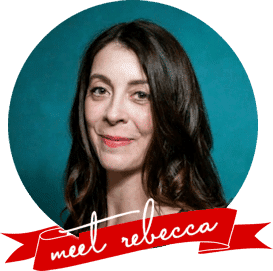 Just perfection again Rebecca! Thank you so much, Leela!! I’m also a notorious modifier… but that’s how the best stuff happens! I’m so glad you guys like it as much as we do! This is the fourth time I’ve made this recipe and my fiancee loves it. That rocks, Janelle! I’m so glad you both love it! I’m so glad you loved it, Marla! I’m also so happy you took the time to get in touch with me and let me know. Thank you for the great rating. Thank you very much for this recipe! I made it for my family to kick off Thanksgiving holiday with my family and everyone loved it.I served it on a large platter with Mexican style rice as a family style dinner so it was quite festive. This recipe will become a family tradition thanks to you. I’m a 70-year young Caucasian woman who loves to cook with her 72-year old husband and 42-year-old daughter who also love to cook. We love it all, but most especially the way you describe everything you do as a culinary expert. The way you describe the way you put together your creation is like poetry! Thank you for the fun we had making the Barbacoa last night and then making it again tonight…to munch on as we choose. I only have 5.21 pound of roast. Would that change the ingredient measurements? Or would I be safe to do what you have listed? Hey Beverly- You’ll probably have a little extra sauce, but that should be fine! Thank you so much for your quick reply, making this tomorrow for a Mexican style Christmas party. So excited to try this!! So do we make the sauce with all ingredients to marinate in and then remove the meat, Brown it and then put the sauce we marinated the meat in into the crockpot? Hi there, thank you for this recipe as I love barbacoa! One quick question though, wether I use a slow cooker or insta pot, do I need to add any liquid to this before heating? My normal recipes for other items have me always put water in or some sort of liquid. Will I need to do the same here since all of the items blended to make more of a paste than liquid? It’s sort of a watery paste so I’m afraid the slow cooker or instapot won’t have any steam to use to cook. Please let me know, thank you. Hi Rachel- If you’re sensitive to spice or have reflux, I recommend tasting a little bit of the ingredients before committing the whole recipe to them to be sure you’ll be able to handle the level of spice. The good news is you can still get the smokiness of chipotle peppers with just a very small amount. If you try again, and I hope you do because this is delicious, just add half of one chipotle pepper. I’m so, so glad you love it, Katie! And I love the idea of making it with chicken!